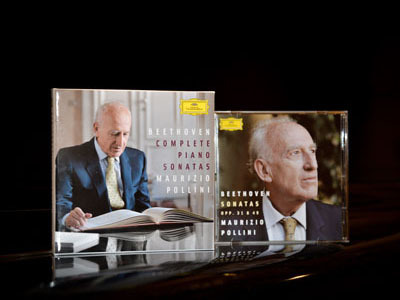 MUNICH — It took him 39 years, but Maurizio Pollini has now completed his recorded survey of Beethoven sonatas here in the Herkulessaal, where the project began. The final sessions, for the Opp. 31 and 49 pieces, were held in June this year, and the resulting CD set is due for U.S. release on Dec. 2, according to Amazon. In all, twenty-three of the sonatas were taped in the 1,270-seat shoebox hall, part of Munich’s Residenz arts complex and a favorite venue of the 72-year-old Lombard pianist since he used it for his legendary Chopin Etudes disc in 1972. First built in 1842 as Bavarian King Ludwig I’s throne room, bombed during World War II and reopened for concerts in 1953, the stately but drab Herkulessaal remains this city’s one acoustically satisfactory venue for symphonic music and is a home to the Bavarian Radio Symphony Orchestra. Pollini’s slowly deliberated cycle, involving no second passes, started with the Opp. 109 and 110 sonatas in June 1975, when he was 33. Munich sessions continued in 1988, 1991, 2002 and 2007, while nine sonatas were recorded in Vienna and Lucerne. The record label is Deutsche Grammophon. This entry was posted on Monday, November 24th, 2014 at 7:44 am	and is filed under Munich Times. You can follow any responses to this entry through the RSS 2.0 feed. Both comments and pings are currently closed.